The savings that can be recognized when you order business checks online has caused many company owners to make the switch. Web-based printers typically charge ten to thirty percent less than most financial institutions. This translates into a significant annual savings in overhead for many companies. 1) Continuous: Continuous business checks are designed for dot matrix printers. Each separate one is connected by a perforation so that they can be fed into the printer. This allows them to be printed "continuously", as they are so-called. This variety is not as popular as they once were. Dot matrix printers have been largely replaced by other types of printers (namely laser ones). However, some businesses still use and prefer this type of printer. 2) Laser: This type is the "modern" version of its continuous cousin. This type can be printed from a laser printer. Laser business checks must be used with check-printing accounting software. Two of the most popular software programs include Quickbooks and Quicken. However, literally dozens of accounting software programs exist. Make sure that the laser business checks that you order are compatible with the kind of program that your company uses. 3) Manual: Continuous and laser are both types of "computer" business checks. That is, they are filled in by a computer and printed on your office printer. Manual ones, on the other hand, must be filled out by hand (as the name implies). A few factors will influence your decision whether to purchase manual or computer business checks, or some of both. If your company writes a lot of them, particularly to vendors that are paid on a monthly basis, filling out numerous manual ones at once can be onerous. It's wise to choose computer versions in these circumstances. You may not write many business checks in a month if your company is very small. It may be better, in this case, to purchase manual ones, particularly if they're cheaper than computer versions. Many companies purchase a mix of both. Computer versions are often used to pay monthly accounts or payroll. 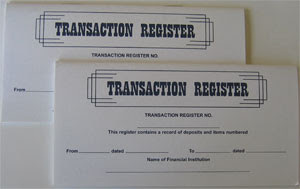 Manual ones are used for incidental purchases or purchases made off-site. Having manual ones on hand in addition to computer business checks is usually the most convenient and practical option for many companies. No matter what kind you buy when you order business checks online, they come in different formats. Some of these include three-on-a-page or smaller-sized documents for traveling. Make sure that you know exactly what style you need before you purchase. Besides choosing the right style, it's also imperative that you have all of the correct information for printing. You'll have to supply your printer with all of your business info, including name and physical address. You must also provide your bank's info, your account number, and a MICR Specification Sheet (available from your financial institution). Be sure that all of this information is accurate and correctly-spelled when you order business checks online. Many printers will not re-print if there are errors in information that are a result of inaccurately-supplied information. Once you order business checks online, your information is usually stored in your file. The next time you order, you won't have to fill out this information again. You can simply visit the site, input your password, and click on a "re-order" link. Your stored information will automatically be printed on your documents.